(1) Boil 2 large sweet potatoes in a large pot with a cover for about an hour. (The potatoes should be very tender. After an hour, if a regular butter knife can easily cut through the potato, it’s ready). While this boils, you can start on your crust. (2) Whisk together the dry ingredients (flour, sugar, powder and salt) into a medium-sized bowl. 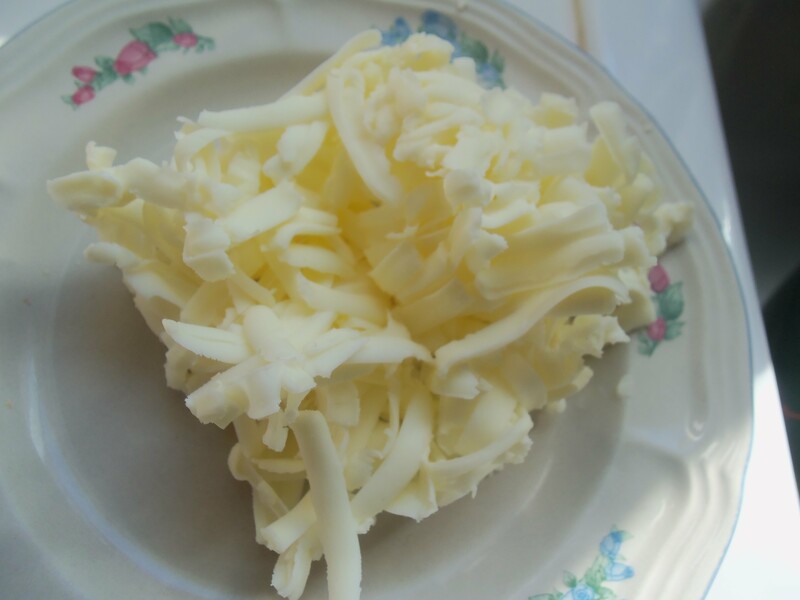 Take the cold butter and you can either cut it up into small cubes or grate it on a cheese grater. (I’ve found that I like grating the butter instead of cutting into cubes. The butter melts so quickly, that when cutting it into cubes it get messy). After you’ve cut or grated the butter, put it back in the freezer for about 10 minutes so it can harden again. Add the cold butter to the flour mix and begin mixing it together with your fingers. You’ll want to make sure all the butter is covered in flour and it may even start to stick together a little bit. (3) In a separate small bowl, mix together the milk and oil. Pour the milk and oil into the flour mixture. With either a fork or a pastry blender, mix together so that all of the flour has been touched by the oil and milk. (Don’t worry that a ball of dough isn’t forming. This pie crust isn’t going to be rolled but is going to be pressed into the pie pan. My Pyrex pie pan was too large, so I used a 10″ tin pan that you can get at any grocery store and it worked just fine). 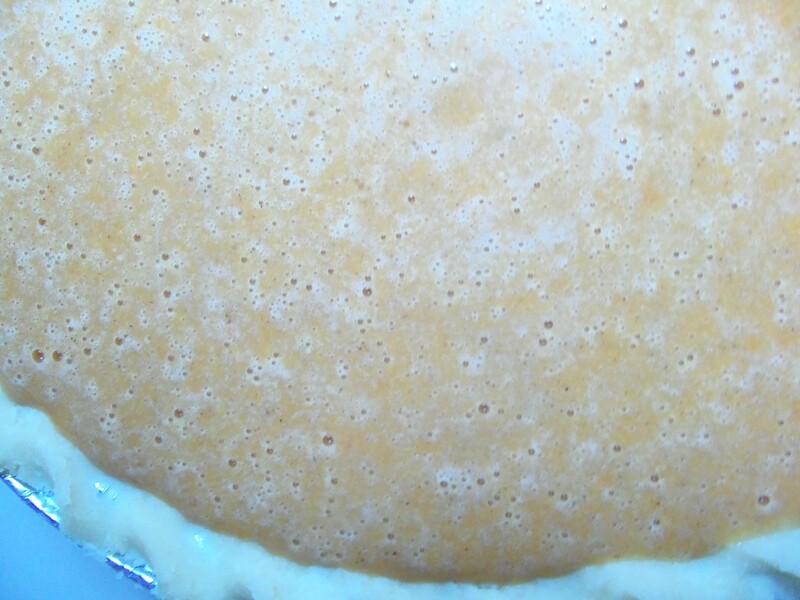 Dump the dough into the pie pan and press the dough evenly to the bottom and up the sides of the pie pan. (You’re never going to get it perfectly smooth so don’t worry so much about finger marks. Just try to make it as even as possible). When done, put the dough and pie plate in the freezer until you are ready to fill it. (5) Once your sweet potatoes are tender enough, take them out of the pan to cool down. While cooling, begin to preheat your oven to 325 degrees. Once cooled, cut them into slices and/or cubes and mash in a separate bowl. From that separate bowl, take 2 cups of the mashed sweet potatoes and put it in a mixing bowl. (You’ll likely have some leftover mashed sweet potatoes. Just throw some brown sugar or cinnamon and sugar on them and have as a healthy mid-day snack). (6) Add the brown sugar, plain sugar, salt, cinnamon and nutmeg to the mashed sweet potatoes and beat until combined. Next, add in the melted butter, evaporated milk, vanilla and eggs, stirring thoroughly between each addition. (If you really wanted to you could beat this with an electric mixer, but the milk will likely spray out and make a mess of your kitchen. Therefore, stirring by hand is likely best). (8) Cook for about 1 hour. 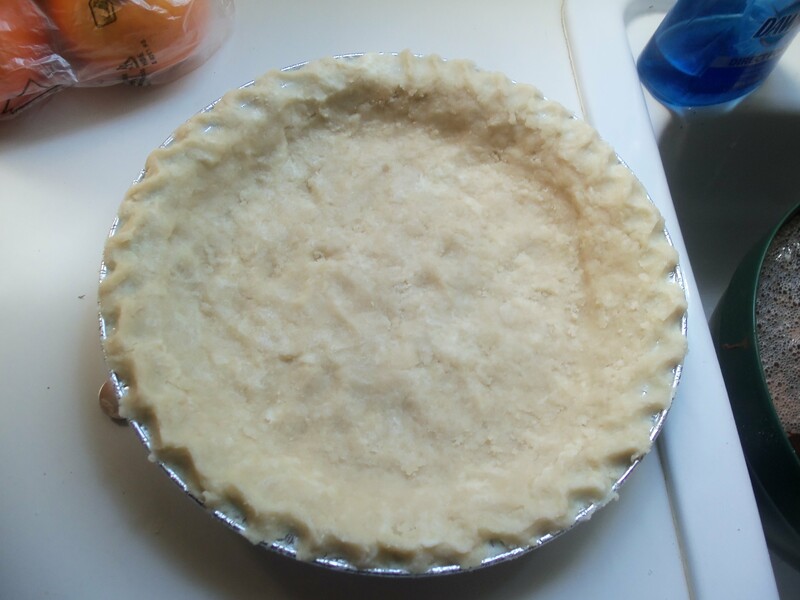 When the pie is done, the crust should be browning and the filling should look set with the center of the pie jiggling a little when moved and shaken. Recipe Adapted from my wonderful grandmother Vennie Mae Watson. 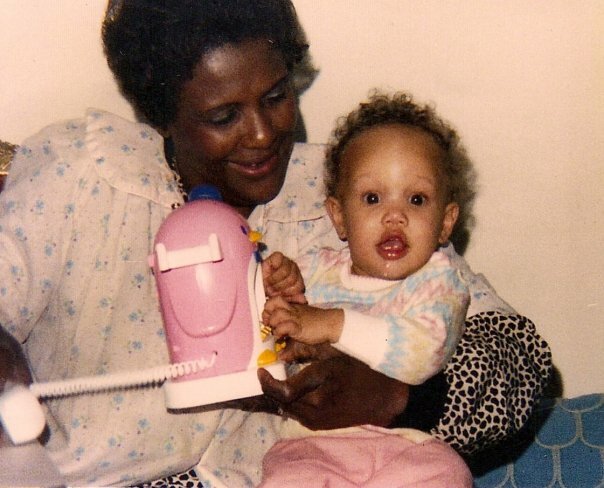 I love this Thread- Sweet Potato Pie, my Mom and Daughter. Looks like she is carrying the tradition from my Mom of baking. The pie tasted delicous. Although my family never ate pumpkin pie for Thanksgiving, I have to admit I am a sucker for anything pumpkin. Pumpkin ice cream being my ultimate love. My town is the self-proclaimed pumpkin capital of the United States, so I think if I didn’t like pumpkin I’d be exiled. Hope you have a wonderful Thanksgiving! 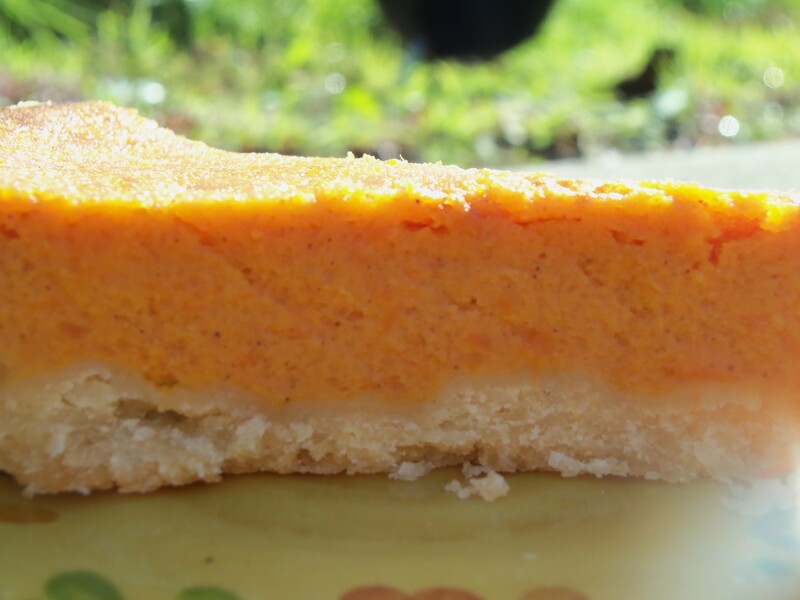 Sweet potato pie has never been one of my favorites but pumpkin has my vote. yours looks better compared to tons of other ones on blogger sites because it has better. sweet potato pie has to have butter!! 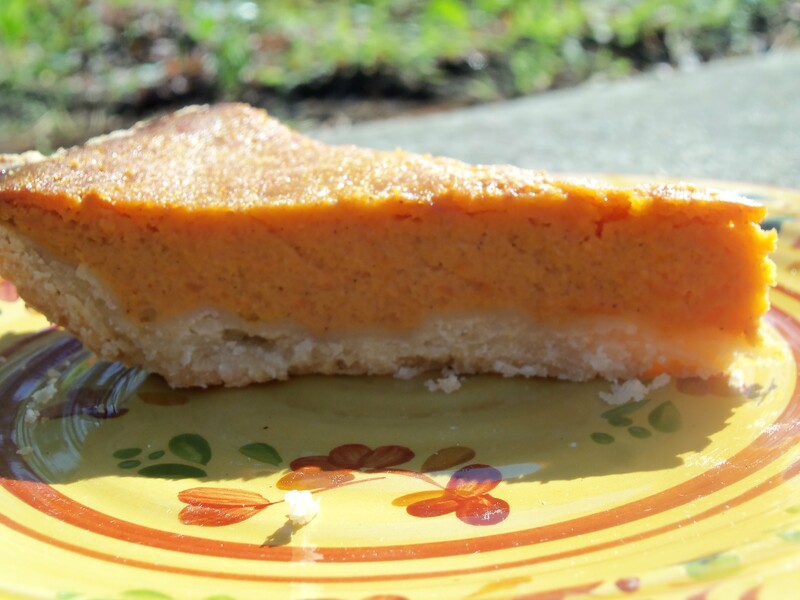 This pie is AMAZING, even though I totally flubbed up and forgot to measure out the sweet potatoes after mashing them. To make it dairy free and gluten free, I used rice milk and earth balance margarine, and a traditional gluten free pie crust. I had way too much filling for a 9″ pie crust; I’m thinking I might have just enough leftover for one more pie. The ingredient list was a bit confusing since it lists 1/4 cup melted butter and then 1 Tablespoon of butter. I went ahead and melted the extra Tablespoon of butter, then I got to the part of the instructions where it said to add vanilla, and I finally figured out that the extra Tablespoon of butter was actually supposed to be a Tablespoon of vanilla. In any case, the pie tasted absolutely fantastic! I will definitely be making this one again. Oh and by the way, it took my pie 1 hour and 10 minutes to bake completely. Thank you for sharing your grandmother’s awesome recipe! I’m glad you enjoyed it!! And yes it was 1 tbs of vanilla.